The amount of forage produced in pastures changes each year mostly due to rainfall and temperature fluctuations. Hot and dry years tend to have less forage production than wet and temperate years. Most of the time, the changes in forage production are not considered in the grazing management and the herd size is kept constant rather than adjusted to match the amount of produced forage. Consequently, pastures tend to be overgrazed in hot and dry years and undergrazed during wet and temperate years. Contrary to expectations, overstocked pastures decrease animal gain and forage production. Grazing forages close to the ground (i.e., less than 3 inches stubble height) decreases the amount of sugars and other nutrients left for pasture regrowth, thus reducing forage production in subsequent years. This situation is aggravated by the absence of fertilization in introduced pastures intended to replenish animal forage extraction. Even though the worst consequences to pastures occur during overstocking, understocking also has its own negative effects. The excess forage will mature, resulting in low forage quality, livestock consumption and animal gains. The mature forage will substantially reduce, even cease, leaf and stem growth to invest its energy in seed production. Moreover, undergrazed pasture may need to be burned early in the next season, which is an extra cost for removing the top deteriorated forage layer and allowing sunlight into the canopy for initiating new shoot growth. For that reason, matching the correct herd size and grazing time with pasture production every year is crucial for maintaining long-term pasture productivity and profitable animal production. Forage production can be measured, estimated or simply guessed from experience. Forages can be accurately measured by clipping and weighing, which is a labor intensive and time-consuming method. On the other hand, the grazing stick allows a quick estimate of forage production based on readings of forage height and canopy cover. At the first glance, the grazing stick seems like a simple yard stick, but it is a complete measuring system. Grazing sticks vary from state to state to accommodate the most pertinent guidelines according to the region. However, most grazing sticks have the same features, such as a ruler for measuring forage height and canopy cover, conversion tables, formulas and grazing guidelines for quick pasture management decisions. Although different grazing stick models look alike, it is recommended the producer uses the grazing stick developed for his/her own state, because the forage estimates presented in the tables may change across the region. Those estimates are developed based on forage clippings performed for each region and, consequently, their values will differ to better accommodate each forage production potential for each region. The grazing stick model that best fits your location can be found by accessing the link: http://articles.extension.org/pages/28873/finding-a-pasture-stick-in-your-area-for-your-organic-dairy-farm. The objective of this Fact Sheet is to support producers estimating forage production in a rotational grazing system by mastering the use of the Oklahoma grazing stick to properly modify herd size and number of grazing days. Even though the Oklahoma grazing stick is the focus of this publication, most of the procedures described here are applicable for all grazing sticks. • Equations to calculate number of animals, available grazing, etc. All tables described in this Fact Sheet are present on the Oklahoma grazing stick, with the exception for Table 5, which makes it a complete forage production and animal allocation system. 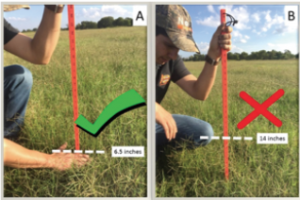 The procedures of how to use the Oklahoma grazing stick can be divided into three major steps: 1) defining your management system, 2) estimating forage availability and 3) forage allocation. • The optimum pasture grazing period based on livestock type (Table 1). • The recommended pasture rest period based on forage growth rate and pasture type (Table 2). • Grazing system efficiency based on animal forage utilization (Table 3). For instance, choosing the lowest cost and efficient system (continuous) results in the longest grazing period and no resting period, which would be inappropriate for raising dairy cattle in a slow growth native field because it may lead to pasture overgrazing. Moreover, choosing the highest cost and efficient system (daily rotation) results in the shortest grazing period and the longest forage resting period would be inappropriate for raising goats in a rapid growth introduced pasture because it may lead to pasture undergrazing. Conversely, choosing an intermediate cost and efficient system (eight paddocks) containing a reasonable grazing and rest period would be appropriate for raising stockers in an introduced rapid to moderate growth forage. Table 1. Optimum grazing periods. Table 2. Recommended Rested periods. Table 3. Grazing efficiency based on pasture utilization. The information provided in Tables 1 and 2 can be used as inputs for the Equation 1. This equation calculates the number of pastures units. After this, the grazing efficiency of your grazing system can be estimated by entering the number of pastures in Table 3. Those two pieces of information, number of paddocks and grazing efficiency, will be used in future calculations. Case study: A producer has 500 acres of bermudagrass, and is planning to raise beef cattle in this area. In this case, the maximum graze period for beef cows is three days (Table 1), and the bermudagrass, which is a rapid growth/introduced forage, needs to have at least a resting period of 15 days (Table 2). Therefore, the number of pastures needed for a functional operation is six pastures of approximate 83 acres (500 ÷ 6), which confers a grazing efficiency of 40 percent (Table 3). Even though Tables 1, 2 and 3 allow us to calculate the number of pastures and grazing system efficiency, keep in mind that this is a rough estimation based on simple Oklahoma state average values. Those average values may not be adequate for a specific operation considering that pastures have a natural yield variation. Therefore, it is necessary to estimate the forage availability for each pasture unit to refine the operation system planning. Measurements should be taken prior to moving livestock to each pasture unit. Walk through the pasture and find random spots. In other words, do not choose the area to the measured. Never select the highest- or lowest-yielding spots because it leads to under- or overestimation. The main objective is to take enough samples that cover the whole pasture variability. As a rule of thumb, it is recommended to take 15 to 20 pairs of measurements (plant height and canopy cover) per pasture. However, the number of measurements depends on how uniform the pasture is. 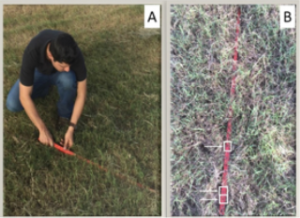 Productive and uniform bermudagrass pastures would demand no more than 15 measurements. On the other hand, a bermudagrass pasture that contains both good and bad areas would need at least 20 measurements for accounting all its variability. Keep in mind that distribution of forage types should be also accounted. For instance, a pasture dominated by bermudagrass on one side and by fescue on the other side must be split into two sections, and the measurements of each section should be worked through the grazing stick methodology separately, then averaged. Case study: After determining the number of pastures and grazing efficiency, the producer visually realized that the six bermudagrass pasture units have a natural production variation among them. The eastern pastures have higher and even stands than western pastures. Therefore, at least 20 measurements in the western pastures and no more than 15 measurements in the eastern pastures will be needed. One of the pasture units is dominated by bermudagrass on one side and by fescue on the other. For this specific pasture, the producer split it into two sections, and the measurements of each section were worked through the grazing stick methodology separately, then averaged. b.Look at the ruler face of the stick, record the average height of the plants in that specific spot. To find the proper plant height, gently push your hand into the canopy and record the height where you start to feel a modest resistance from the forage leaves against your hand (Figure 1A). Feeling a modest resistance from the forage leaves means that your hand already touches half of the plant leaves under your hand. Do not pull the leaves up. Do not record the highest leaf or shoot (Figure 1B). Focus in measuring the height where leaves are found if the forage already has an elongated seed head. Trampled spots should be avoided; however, if most of the pasture was trampled or lodged, lift the plants up to their natural stand and measure the proper height rather than stretching them. Figure 1: Proper (A): average forage leaves height. Improper (B): highest plant or shoot. Focus in measuring the height where leaves are found if the forage already has an elongated seed head. Figure 2: Estimating canopy cover: (A) slide the stick under the canopy with the ruler facing up, and (B) count the inch-marks covered by vegetation out of 33. Three uncovered marks; therefore 27 covered out of 33.
a.At the same spot of the plant height measurement, slide the stick under the canopy with the ruler facing up. c.Multiply the total number of covered inch-marks by three to estimate the percent canopy cover. b.Using Table 4, select the dry matter range based on most appropriate forage type and average canopy cover. Case study: the producer measuring the first bermudagrass pasture estimates an average canopy cover of 85 percent after 18 random measurements, and this pasture is assigned to the 75 to 90 percent cover which estimates 375 pounds of DFacre-inch. However, he could estimate 250 pounds of DFacre-inch if the averaged canopy cover was in the lower range, e.g. 75 percent; or he could estimate 300 pounds of DFacre-inch if the average cover was in the middle range, e.g. 80 percent? Table 4: Estimated Available Standing Dry Forage (lbs acre-1 inch-1). c.Multiply forage height available for grazing by the DMacre-inch (step 4) for estimating the DMtotal-acre. It is very important to consider the residue height in this calculation. The proper residue height is to ensure that some stems and leaves remain in the pasture for quick regrowth. Grazing below the residue height slows regrowth and decreases yield. On the other hand, the forage quality and animal gain will progressively decrease as height increases after overcoming the “begin graze” height recommended in Table 2. In other words, the forage might hold a decent quality at higher height than the ones recommended for beginning grazing; however, the forage quality will be not at its optimum level anymore. Table 5: Grazing management guidelines. 2 inches (available for grazing) x 375 pounds per acre-inch-1 = 750 pounds per acre-1. Table 6. Forage needs per animal unit (1,000 lbs). Keep in mind that the forage needs in Table 6 are based on an animal weighing 1,000 pounds. The forage needs will need to be re-adjusted if the animals weight is higher or lower than 1,000 pounds. If the producer is starting an operation and still planning on purchasing livestock, it is wise to calculate the number of animals (Equation 2) that the property can support based on the animal forage needs and the fixed number of available grazing days for each pasture calculated by Equation 1. This is exactly the approach in the Case Study presented in this Fact Sheet. On the other hand, the producer might be interested in calculating the available grazing days in each pasture unit based on the fixed number of animals that compose his/her herd (Equation 3). This second approach fits well in an ongoing operation with the capability of expanding the total pasture acreage, reducing the herd size and/or introducing best managements practices for improving pasture production such as proper rotation, fertilization and weed control. The final step is to adapt the grazing system based on the calculations above. As mentioned before, the number of pastures units, grazing days and rest periods are calculated using rough values. However, the grazing management can be fine-tuned based on the estimation of forage availability and forage allocation for each pasture unit. Adapting the grazing system is a task that requires versatility and technical knowledge. Furthermore, keep in mind that the grazing stick forage estimates are simply based on the state average; therefore, it is wise to interpret the results as a reference rather than as an accurate value. It is wise to be conservative when planning, in other words, expect lower production from your pastures. In this case, the chances of overgrazing, the worst case scenario, is minimized. The worst that can happen is a minor undergraze condition if a conservative approach is adopted. Minor undergrazing can be easily fixed by increasing the herd next season. Nonetheless, it would be ideal to have the most realistic grazing stick estimates for each specific pasture because it would result in more accurate calculations for developing a proper grazing system. For that reason, the grazing stick can be calibrated for specific pastures for higher accuracy. Using a modified version of Equation 1, the number of grazing days would be recalculated respecting that the bermudagrass demands at least 15 days for proper regrowth (Table 2).